Geshe Lhundrub Sopa, Maitripa College, Portland, Oregon, US, 2009. Photo by Marc Sakamoto. His Holiness the Fourteenth Dalai Lama said of Geshe Lhundub Sopa, “He is an exemplary heir of Atisha’s tradition conveying the pure Dharma to a new world in an authentic and useful way. 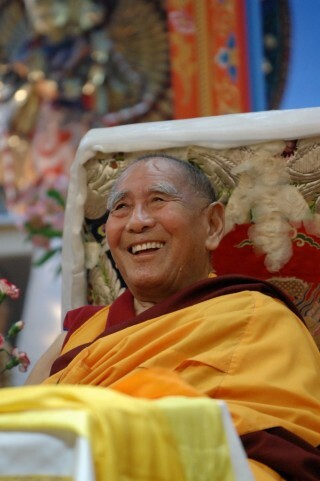 He has been a pioneer among those bringing Buddhism to the West.” One aspect of Geshe Sopa’s legacy is an extensive English-language commentary on Lama Tsongkhapa’s Lamrim Chenmo, called Steps on the Path to Enlightenment. Wisdom Publications has just published the fourth volume of this five-volume work. In it, Geshe Sopa, who was a teacher of both Lama Yeshe and Lama Zopa Rinpoche, offers a detailed discussion of shamatha, or calm-abiding. So what are the trainings of bodhisattvas, those who have the bodhichitta goal? Perhaps foremost is the taking of the bodhisattva vow and then training in that. The bodhisattva vow contains within it all of the bodhisattva’s practices. This includes avoiding negative actions and training in the six perfections: generosity, ethical discipline, patience, perseverance, meditative stability and wisdom. We have discussed these perfections quite extensively in the previous volume and gone into many details on how bodhisattvas train, particularly in the first four of these. Tsongkhapa dedicates the final two chapters of the Lamrim Chenmo to the last two perfections, meditative stability (dhyana) and wisdom (prajna). Almost half of the text involves how to train in the concentrated mind and in the wisdom knowing the ultimate truth of emptiness. Meditative stabilization is addressed specifically through the cultivation of calm-abiding, or shamatha, the mind resting in single-pointed focus. The perfection of wisdom is addressed through the cultivation of special insight (vipashyana) into emptiness. The present volume presents Tsongkhapa’s chapter on cultivating the serenity of shamatha, while volume 5 of this series presents the chapter on developing the insight called vipashyana.